The Vivid Audio K1 is a pretty unusual looking speaker and Vivid Audio is a pretty unusual loudspeaker manufacturer. Based in South Africa, it makes all of its own metal drive units and encloses them in high tech cabinets with not a scrap of MDF or wood of any sort in sight. 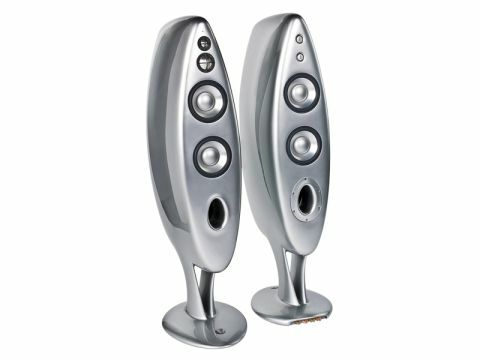 The Vivid Audio speakers are designed by Laurence Dickie, the man who is responsible for the original B&W Nautilus, or snail speaker. It's also a design that has had a profound influence over that company's entire range since it was created in the early nineties. Nowadays, Dickie works at Turbosound, the live PA specialist, and Vivid speakers are his only domestic creations in production. The Vivid K1 was the biggest speaker in the range until the arrival of the mighty Giya. It stands 1.3m high on its moulded-in stand and while its slim shape ensures that it does not impose too much, it still makes its mark in the room. The distinctive form is achieved using a cast carbon fibre reinforced-polyester compound for the cabinet. This is a material that is selected for its ability to be moulded into an acoustically desirable shape from the perspective of both stiffness and the removal of diffraction. With a box cabinet, sound radiates not only away from the drivers but across its front surface until it reaches an edge at which point it diffracts or bounces off. The curved shape around the mid and high frequency drivers, in particular on the K1, ensures that this does not happen. The final benefit from using this material is that it can be finished with almost any spray paint available on the market, apparently, the Korean Vivid distributor launched the Giya with a sample finished in a daring Lamborghini orange. Like the smaller Vivid B1 the K1 has mid/bass drivers on both the front and the back of the enclosure, in this case four in total and these operate in a very unusual fashion. For bass below 100Hz, all four are in use. For frequencies above this point, the output of the two rear units and the lower front unit is rolled-off leaving only the top front unit to produce bass and midrange up to 880Hz, where it hands over to the midrange dome. Dickie calls this crossover a series parallel square because it maintains linear impedance across the band. It's a good example of the ingenuity that he has brought to this and the other Vivid speakers. The Nautilus influence can be found in tapered tubes that extend behind the mid and treble domes within the cabinet and have their ends covered on the rear side. By designing these domes with external ring magnets the rearward radiation can be absorbed by damping in the tapered tubes. The two anodised aluminium domes are not hemispherical but catenary in shape, which is like a suspended chain. This shape, more precisely described as a rotated catenary, was chosen because it pushes the first break-up mode of the driver up to 50 per cent higher than can be achieved with regular aluminium domes. The K1's crossover is in the relatively flat base of the speaker with the signal being carried to the drivers via van den Hul cable. The base itself discreetly houses bi-wire WBT terminals and no fewer than five threaded holes for spikes, not something we chose to use, but hours of levelling fun could be yours should you feel the urge. The first thing you notice when firing up this speaker is that it seems to have a lower noise floor than other speakers. Backgrounds are distinctly quieter. This makes no sense at all, as speakers don't have a noise floor because speakers are passive devices that transduce electrical energy into acoustic energy and, therefore, should all be intrinsically silent. And yet this is not the first time the phenomenon has been encountered so there's something clearly going on here. Noise floor is not the right description really as it's more like a lack of overhang. What you are not hearing is a box joining in or drive units not being able to contain resonances. This speaker is so fast and devoid of box colouration that it just doesn't join in with the music the way that so many others do. It's a quality that's so common that we accept it as part of the music rather than as a distortion. But, take it away and you know that you are hearing a cleaner result. This seems to be most obvious with piano pieces, the first disc to be spun was one of the Schiff Beethoven sonatas on ECM. At this stage, it was only clear that there seemed to be less noise on what is an extremely quiet recording, which in turn produced a more musically engaging result. And also one with more dynamic range than is usually perceived, which is a sure sign that there is less noise coming out of the system. It was not until we put on Keith Jarrett's Carnegie Hall disc that it became clear that the piano sounded less fulsome and woody than usual, but also that it was more realistic in its solidity. After all, concert grands stopped sounding woody a long time ago. This result could be interpreted as the K1 being short on instrumental timbre, but the sheer level of detail that's on offer here rather rules that out. Each instrument still has a character, Avishai Cohen's double bass is quite woody enough and for some subtle reason his playing, along with that of his two cohorts, takes on a greater sense of occasion in this speaker's hands. The longer you listen with the K1, the more you can hear and one thing that's perhaps less welcome is that it's highly revealing of the amplification with which it is partnered. We tried the Trilogy pre/power pairing that we also tested this month because they are similarly fast and have such great musicality. But they aren't quiet enough, as the low level hiss that the valves produce undermines the end result. On the other hand, Leema's Pyxis preamp and Altair IV power amps, are revealed to be even better than we thought they were, thanks to the K1. They bring a degree of speed and transparency to the result that is in the very top league. Clearly amplifiers used with this speaker have got to be quiet and need to be highly resolute. The same applies to the source. You may not need the very best, but you will have little difficulty in assessing the good from the OK. We got spectacular results with the EMM Labs TSD1 transport and DAC2 with the K1 and Leemas, a set-up that delivers digital audio gratification of the very highest calibre. Discovering just how resolute this speaker is makes us wonder if we ever got the best out of the B1 some five years ago. Somehow we doubt it. The Vivid K1 is undoubtedly one of the finest speakers on the planet. Lord only knows how the Vivid Giya manages to improve on its performance.